Universal Studios Hollywood celebrated the opening of “Christmas in The Wizarding World of Harry PotterTM,” transforming HogwartsTMcastle with a breathtaking animated light projection show, choreographed to a musical arrangement from the Harry Potter movies as The Entertainment Capital of L.A. kicked off the yuletide season. The a cappella Frog Choir, comprised of Hogwarts students and their giant throaty frogs, will also perform original holiday themed songs over the course of the seasonalevent. ​From stockings to ornaments, the addition of specialty keepsakes and gift-giving items complement the land’s immersive holiday festivities as the theme park continues to envelope guests in the captivating world of Harry Potter. A wide selection of all-new custom-made Christmas ornaments created especially for “The Wizarding World of Harry Potter” are available this holiday season. Collectibles include a variety of decorative Hogwarts castle snow globes, Hogwarts crest and mascot ornaments representing each of the houses, as well as a collection of unique tree toppers and house pennant garland. Wizard robes and wands and an array of Quidditch game accessories are perfect for gift-giving. “The Wizarding World of Harry Potter” resonates with immense detail, inviting guests to revel in J.K. Rowling’s Wizarding World with the opportunity to enjoy authentic food and beverages at multiple locations, including Three Broomsticks and Hog's Head pub, as well as the Magic Neep and Butterbeer™ carts. Join the conversation online using#UniversalHolidays and #WizardingWorldHollywood. Like Universal Studios Hollywood on Facebook and follow @UniStudios on Instagram and Twitter. 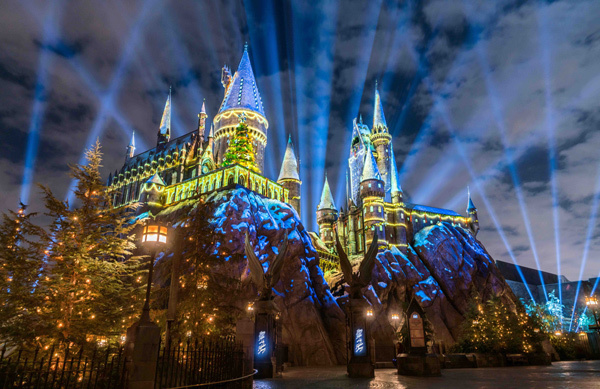 As a leading global entertainment destination, Universal Studios Hollywood delivers highly themed immersive lands that translate to real-life interpretations of iconic movie and television shows. Recent additions include “The Wizarding World of Harry Potter ™” which features a bustling Hogsmeade village and such critically-acclaimed rides as “Harry Potter and the Forbidden Journey” and “Flight of the Hippogriff™,” Universal Studios Hollywood’s first outdoor rollercoaster. The adjacent Universal CityWalk entertainment, shopping and dining complexalso includes the all-new multi-million dollar, completely redesigned Universal CityWalk Cinema,featuring deluxe recliner seating in screening room quality theatres, and the “5 Towers” state-of-the-art outdoor concert stage.